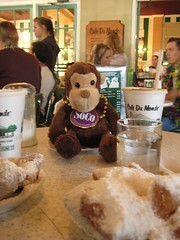 A week ago today, we were in New Orleans, LA enjoying the sights and smells of the French Quarter. Nick hadn't been to my favorite city, much less enjoyed real live showing of boobies on Burbon Street. And I was due for another trip. We stayed at the Iberville Suites and got to walk around the quarter to all the must-see spots like the St. Louis Cathedral, Broussards, the Gumbo Shop, the random gift shops, art galleries, the above ground cemeteries, and Cafe Du Monde. There were a few parades that went by the front of our hotel through out our stay. We saw Kevin Costner who was this year's Grand Marshal for Endymion. And Friday night, Hulk Hogan made an appearance on a balcony on Burbon Street. As a result, so did a few boobies. It would have been much more enjoyable if I had not been recovering from a horrible dual shot of the flu. Yes. I was sick. Again. Nick brought home some debilitating SAR's like virus that knocked me out on Sunday, and roundhoused me in the face on Tuesday. By Friday I had lost 10 lbs, hadn't eaten more than chicken broth and jello, and had undergone a set of pills that resembled near-death-organ-failure type pain. Pain I hope never to ever feel again. Ever. So, we will be going back again so we can enjoy more of the excellent food, art, and live music.